Captain Jubilee Chase is trying to crush the rebellious colonists on Avon, an outpost planet. Little does she know it, but young, good looking Flynn Cormac, as one of the Rebels’ strongest leaders, is her archenemy. The two should never meet, but desperate conditions lead to desperate measures. 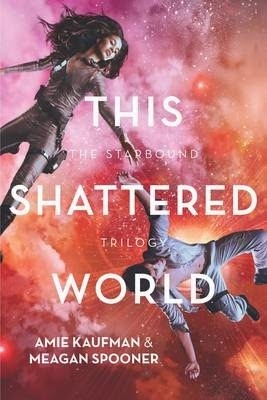 This high action sequel to These Broken Stars (KBR review) is not what you’d expect. The characters are as different to those in Book 1 as is their habitat, but don’t be concerned. The stakes are just as high and so is the action. This time, however, entire communities are at risk rather than two individuals. The threads of mystery and intrigue that wove through These Broken Stars continue in This Shattered World, elusive at times but always hovering in the background. The level of violence in the first few chapters is unsettling for those looking for action rather than violence, but the balance can only be restored with peace. Can Jubilee and Flynn achieve this, separately or together, or is there really no hope left for Avon? Another perfect holiday read, because you are not going to want to put this one down.